And now for something completely different – an American style blueberry pancakes recipe! First off, hello all you lovely fellow Thread Heads! One thing some of you know about me is that I am not a born and bred Brit. I was born and raised in America and moved here to England years back to settle down with my British born now hubby. 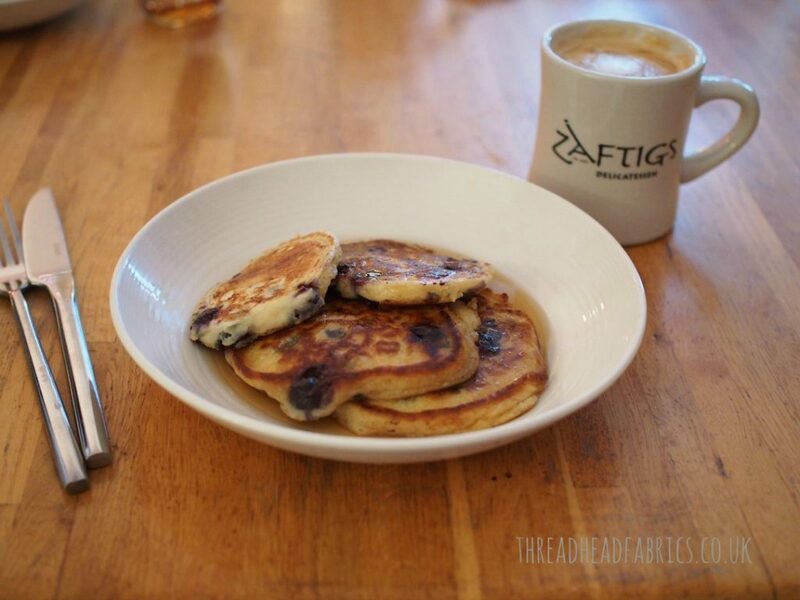 He has come to love some of my recipes from back home and with it being Pancake Tuesday next week, I thought it would be a nice time to share one of his favourite homemade treats – blueberry pancakes! The pancakes I’ve eaten here in England tend to taste more like crepes to my American palate. And while they are very tasty – I love that sprinkle of sugar and squirt of lemon on those British cousins to my typical pancakes – I thought you may want to have a go at making some American pancakes for yourself and your family this Pancake Tuesday! Truth be told, this is actually my mother’s recipe. She would make these for myself and my 5 brothers and sisters as a Sunday breakfast indulgence usually while we were having our school holidays. Unlike here in the UK there is no tradition (at least not one I know of!) where pancakes are eaten in the lead up to Lent. We just had them as the occasional treat. Expect these yummy delights to be thicker than what you may be used to and if you really want to make them American style, serve them up with some grade A maple syrup. It’s available at most UK supermarkets these days, but if you’ve never had it and aren’t too sure you’ll like it, Aldi supermarkets sell it at a very reasonable price! Ok, so time to get cooking! 1/2 cup (4 ounces or approximately 110 grams) of fresh blueberries – I like to add a bit more! In a larger mixing bowl whisk together the egg, milk and oil/melted butter. Little by little add the dry mix to the wet mix using a low speed hand mixer or an ordinary fork. Mix until just blended. If you over-do it you will make the eggs fluff too much! Rinse your blueberries and cut them in half unless they are super small – a thankless job, but they cook up nicely this way! Add the blueberries to the batter and mix through using a spoon. Heat approximately 2 tablespoons of unsalted butter into a large skillet pan. The pan needs to be really hot, but not to the point where your oil/butter begins to burn. Using a ladle, pour enough mixture into the pan to make a pancake that is approximately 3 to 4 inches (8 – 10 cm) across. Get several pancakes going at once, but leave space for you to be able to flip them with a spatula. Once they have bubbled up, check them with your spatula. If they are golden brown on the underside, then carefully give then a flip! After flipping them you may need to press on them a little with the spatula as the bumpiness of the blueberries can make the 2nd side of the pancake cook unevenly. When the second side is golden brown and no wet batter comes out when lightly pressed with the spatula, you’re pancakes are ready to go! Then it’s just pass the maple syrup and enjoy! The recipe will make approximately 12 – 16 pancakes depending on their size. Oh! and lopsided pancakes are as tasty as perfectly round ones (as you can see in my pic!!). These are delish with a cup of coffee! Please leave a comment below if you try them. I’d love to know if you and your family give them a thumbs up! Thanks for reading and until next time, happy sewing *and* happy cooking! This entry was posted in How To's, recipes and tagged American foods, blueberries, pankcake tuesday, recipes.